I have a friend, whom we'll call K (yes, I use a lot of initials, but I don't want people to be angry about their identities appearing online...I'm a big fan of privacy) who has now just had a baby. She has an 18 month old son, E, and a newborn son, C. I've known K as long as I've known A and M from the previous post. I found out this winter that she was pregnant and I obviously was going to make her a quilt. She's dabbled in quilting and has made a top but never quilted it. She does do rag quilts and such though. So anyways, I was going to make her a quilt. The baby room was going to be done up in Mickey Sports stuff but she wanted a "bright quilt like you [I] make" so I had to oblige her. I went with a simplified bento box design that I had played around with in my spare time. I went bright and colorful and somewhat gender neutral with the colors and loved the result. 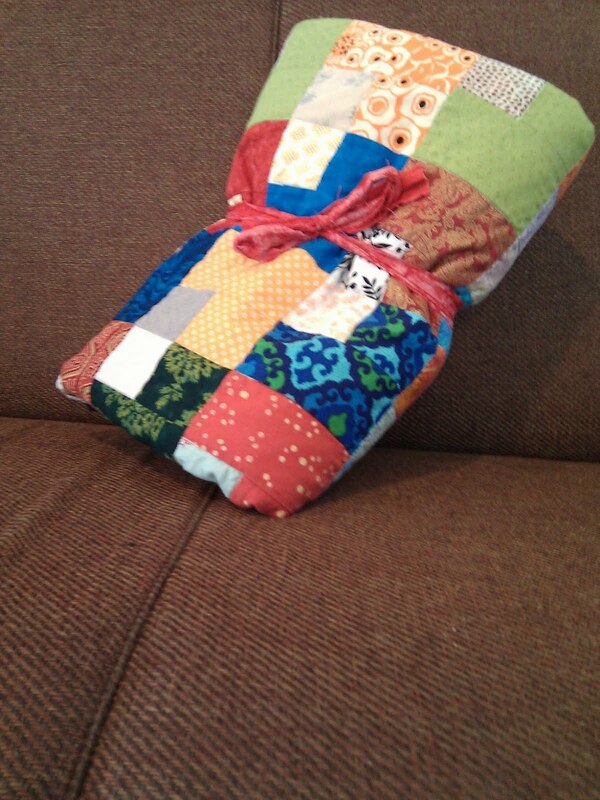 I just quilted in the ditch on this one. I thought about filling in the parts of the boxes with quilting but decided I wanted to leave the design to shine through without the quilting hiding it. 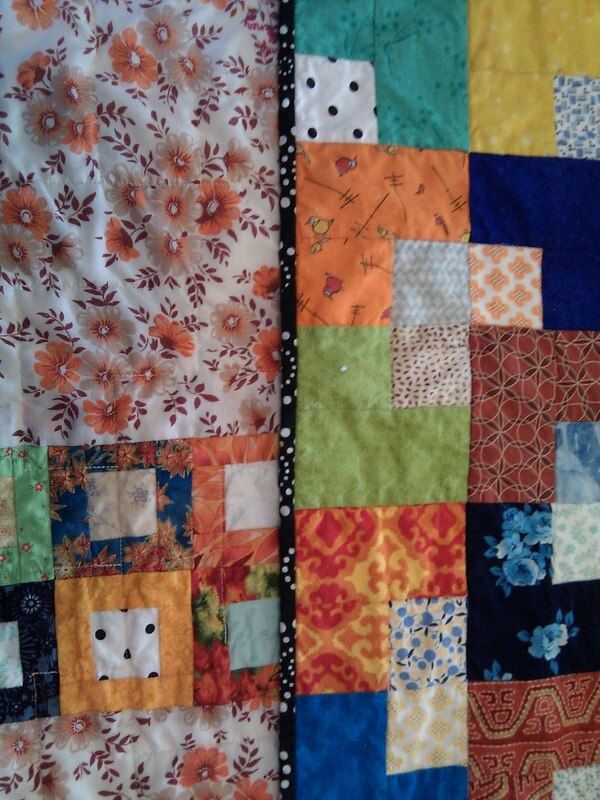 I love quilting but sometimes you just don't want it to outshine the quilt itself. All folded up and ready to give to mommy! This quilt has been almost a year in the making. It was 7 months late, but his mom didn't seem to care. Her inspiration for the baby's room was this bedding set. I did log cabin blocks last June and got the top made up right before I started my international move. I took the top with me on my traveling before leaving the country and bought backing and hand-quilting supplies (mine had long been packed up at this point) to hand-quilt on the driving and flying to get to Germany. JoAnn Fabrics had the PERFECT backing fabric - a striped fabric with all of the colors (green, orange, brown, and blue also with a bit of white and yellow mixed in) which I used. I hand-quilted it with white thread in a combination of loops and stippling. It started out as stippling but I like it crossing over itself every so often...I like the circle-type shapes it creates. Because this quilt was hand-quilted, it got put on the back burner a lot, but it got pulled out more than a few times for driving. My husband usually drives when we're going on a trip, so I sit in the passenger seat and sew or read. 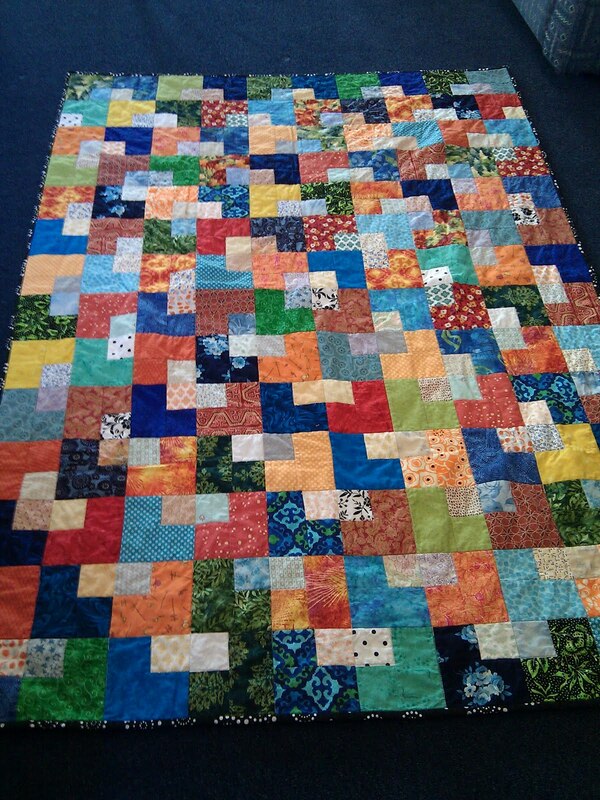 This quilt finally got finished when I was back in the states at the beginning of June. I hand-sewed the binding, got pictures of it, and sent it off to the family who emailed me about a week later thanking me profusely. Baby SM's father is a coworker of mine. She (initials are of her first and middle name, to distinguish her from baby S) is the fifth baby and the first girl. So her quilt had to be girly, that's for sure! She's due August 1 and I've completed the top. 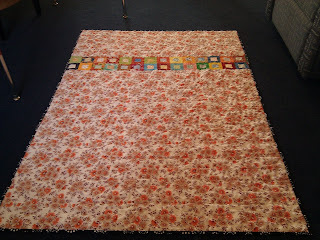 I used Bonnie Hunter's Random Ohio Stars pattern and scaled it back from 12" and 6" stars to 9" and 4.5" stars. I tried to arrange the colors a bit like a rainbow, so the mostly red ones are at the top and the mostly blue ones are at the bottom. It isn't a perfect gradient but it's close. My problem with this quilt is that I have NO IDEA how to quilt it. How do you quilt something like this? I can't just quilt in the ditch without spending a significant amount of time turning the quilt around to go around the sides of the triangle pieces. I can't do straight line stitching based off of the edges of the blocks since they overlap and don't go straight from one side to the other. I've only done one quilt (the doll quilt I entered in the Blogger's Quilt Festival) with free-motion quilting so I'm hardly an expert on that, but I'm thinking I need to figure something out to FMQ on it. But what? Will I have to do separate designs in the stars vs. in the background? I'm stuck. I don't even know if I'm going to do one of what my husband calls my "traditional" backings where I slice it up and put mini versions of the same thing as on the front in a row across it. 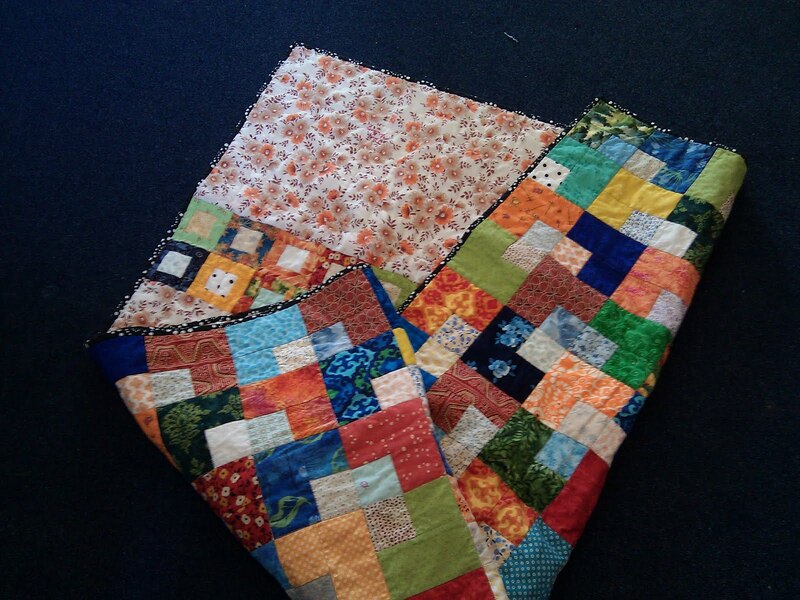 This quilt just has me stymied! Also, I just used the word stymied. Any ideas ya'll have would be greatly appreciated! Oh, and I just noticed (it's hard to see in the picture but it's there) that one star has one set of points turned 90 degrees the wrong way. It's not in an easy-to-fix place so I'll just leave it as it is. My husband convinced me not to tear the whole top apart to fix one piece on a small star, somehow. Oh well, I guess it's got character like a lot of the old antique quilts you see. If you haven't been hiding under a rock or in a cave for the past two weeks, you've probably seen that there is a rather large group of quilters doing the Farmer's Wife Quiltalong right now. I really wanted to do it but don't have the book. Rather than buy the book and do it, I decided to instead do the Civil War Love Letters Sampler Quilt. My now Mother-in-Law (I think this was over the Christmas break where my husband proposed to me, but it might have been the year before, I'm not sure ) bought it for me as a Christmas present. My book, however, didn't come with a CD so I've been tracing the pictures in the book and teaching myself to paper piece with them. It's been a little rough but things are turning out okay. Some of the ones with more pieces are turning out slightly smaller than they should be, but they're generally working out okay. It's definitely fixable with some creative fudging on my sashing (whatever I choose for it). 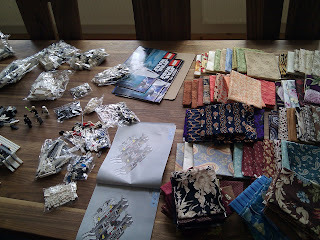 The best part is that I'm using all scraps (I've had to pull the bigger piece of one of the fabrics out when my scrap wasn't big enough one time so far, but other than that my usage is all scraps) from my brown, green, blue, and orange bags. 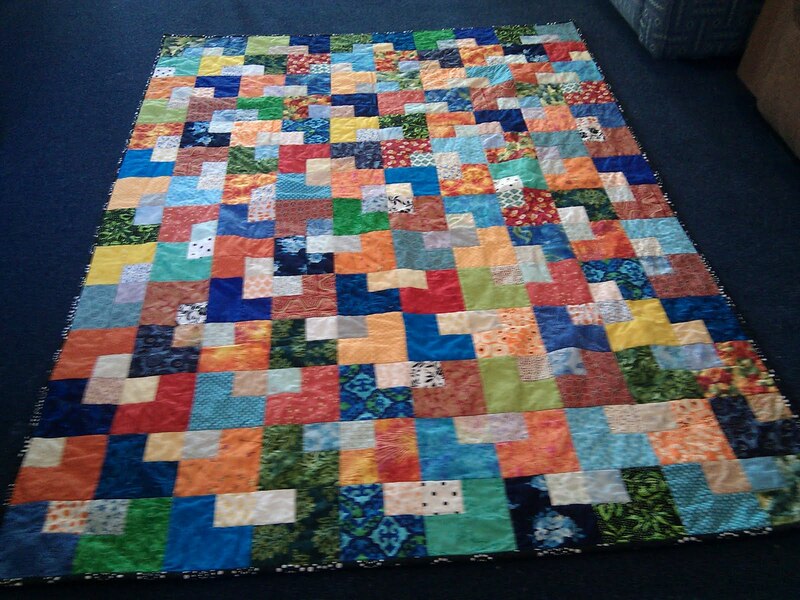 My husband really liked the colors from baby S's quilt, so he requested that I do this quilt in those colors. 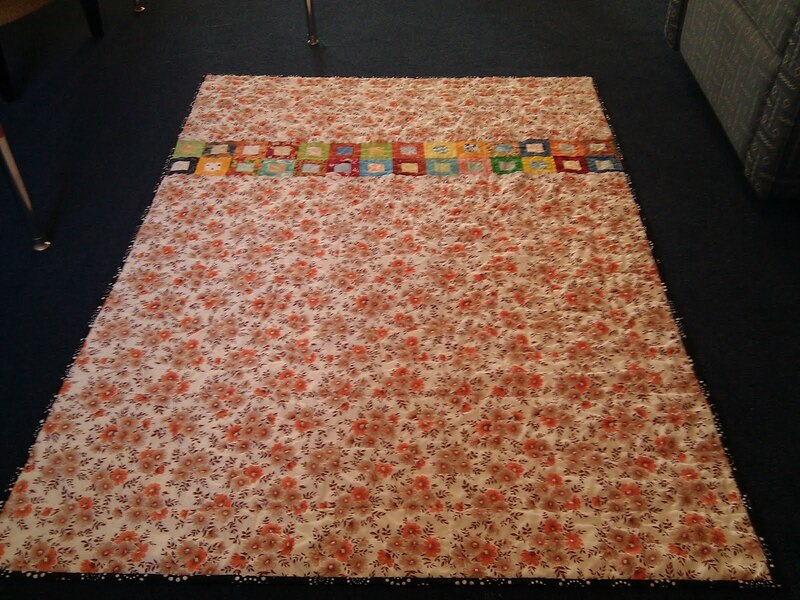 This quilt will be for out bed so I'm going to do enough for two extra rows to make it rectangular. I have NO IDEA how I'm going to quilt this since I only have a tiny machine - maybe I'll find someone around me with a long arm that they can teach me how to use so I can use it? This quilt will most likely end up sized for a California King sized bed (our future bed when we get back to the states) so it's not going to fit in my little Jenny the Janome. 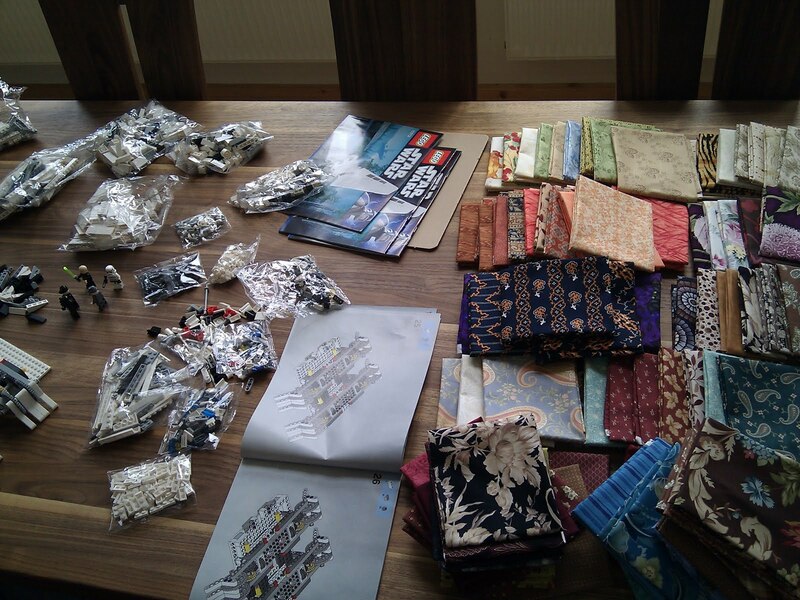 *sigh* Maybe I should save up for a longarm? I can't imagine that I'll be able to save up enough for it to make it happen now or anytime relatively soon but I can always hope, can't I? My husband thinks it's cheating if someone else quilts my quilts, so getting it longarmed by someone else probably isn't an option. I don't know...maybe the size of this one will change that. We'll see.